If you’ve never heard of an egg-laying mountain, you probably don’t know about Chan Da Ya, a mysterious cliff in China that reportedly lays perfectly round or oval stone eggs every 30 years. Chinese media reports that while Chan Da Ya is the largest egg-laying cliff on Mount Gandeng and features the highest concentration of stone eggs, it is certainly not the only one. Photos taken in the same area show eggs coming out of others sections of the mountains as well, some straight sideways, and others hanging down like hornet nests. 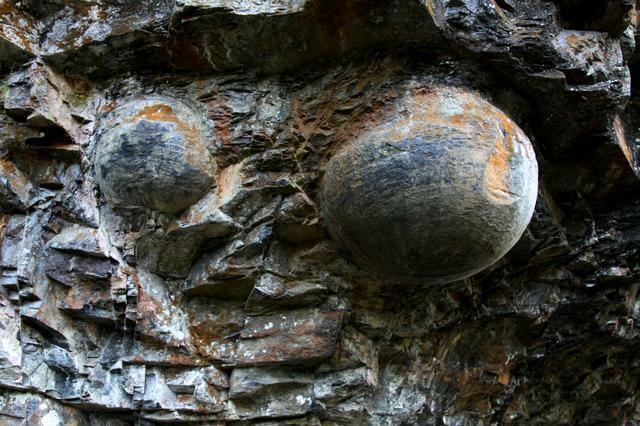 Geologists believe they may have finally solved the mystery behind an odd cliff wall that appears to lay egg-shaped stones every 30 years. Chan Dan Ya – Mandarin for ‘egg-producing cliff’ – is 19ft high and 65ft long. It has an uneven surface but every three decades it emits these odd-shaped rocks. Residents in the nearby village Gulu have been scratching their heads over many years as they keep finding perfectly smooth rocks.